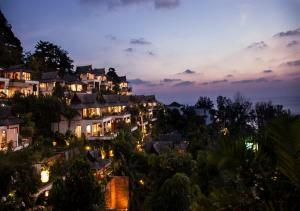 Ayara Hilltops - Adults Only - Surin, Phuket, Thailand - Great discounted rates! 8.5 out of 10 based on 16 verified user reviews via Agoda. Located in Surin, Ayara Hilltops - Adults Only is a perfect starting point from which to explore Phuket. The property offers guests a range of services and amenities designed to provide comfort and convenience. Service-minded staff will welcome and guide you at Ayara Hilltops - Adults Only. Some of the well-appointed guestrooms feature slippers, sofa, wooden parqueted flooring, air conditioning, desk. The property offers various recreational opportunities. Discover all Phuket has to offer by making Ayara Hilltops - Adults Only your base. Ayara Hilltops - Adults Only - Phuket classifies itself as a 4 star hotel.